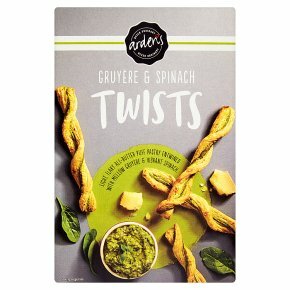 Light, flaky all-butter puff pastry entwined with mellow gruyère & vibrant spinach.It takes two to make a tasty Twist. In this case our perfect pair is mellow Gruyère cheese and vibrant spinach, entwined with all-butter puff pastry and baked to light, flaky perfection. Scoff them merrily straight from the box. But to make more of every mouthful, why not serve them with soup, dunk them into a dippy egg or delve into dips like this earthy spinach & lemon hummus.